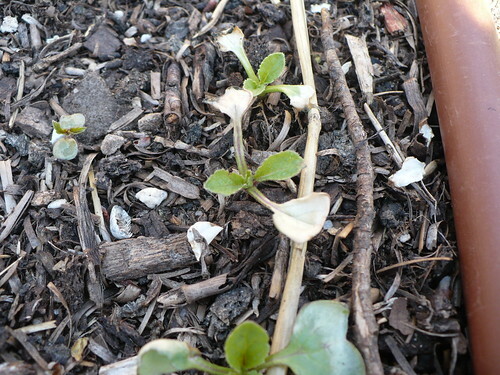 I went out and thinned out some of the radishes this afternoon, and I thought I’d share some pictures as well as a few thoughts on interplanting radishes and parsnips. The radishes were very thick and needed to be thinned whether there were parsnips hiding underneath or not! Given the crazy spring, the radishes aren’t yet at full size, but we needed to get some more sunlight to the parsnips anyway. 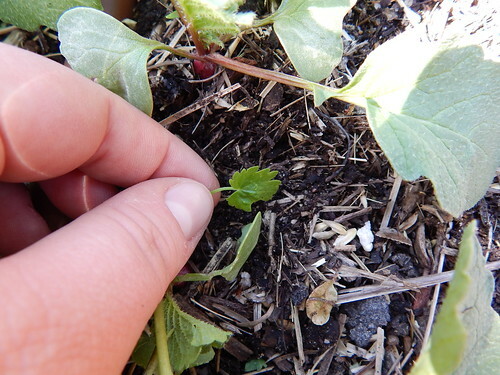 This is what the first few inches looked like after I pulled out several radishes. 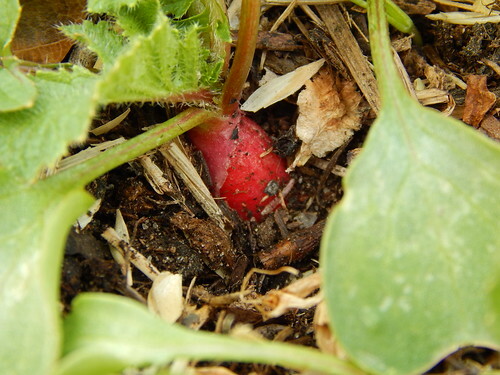 It is pretty tedious work, especially since the radishes are so thick. I had to be extremely careful not to uproot the parsnips. 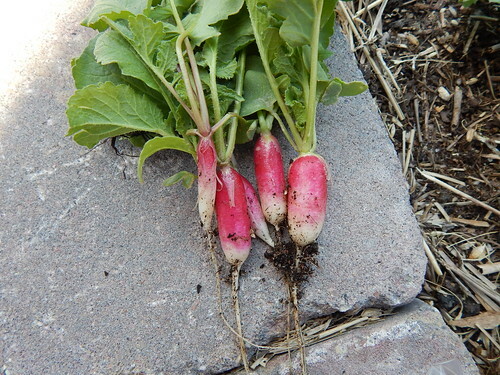 I tried to leave some radishes to get larger, but I pulled the ones that were too close to the parsnip seedlings. In case you weren’t sure what the true leaves on parsnips look like, this is it. For something in the carrot family, the leaves definitely don’t look very carroty. They are much more reminiscent of parsley, actually. This is what the final thinned rows look like. 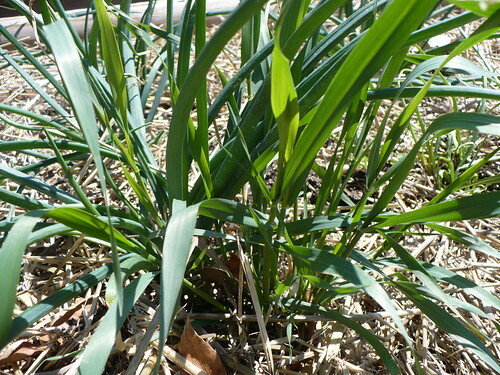 The plants do look pretty floppy at the moment, but they should straighten up in a day or two. 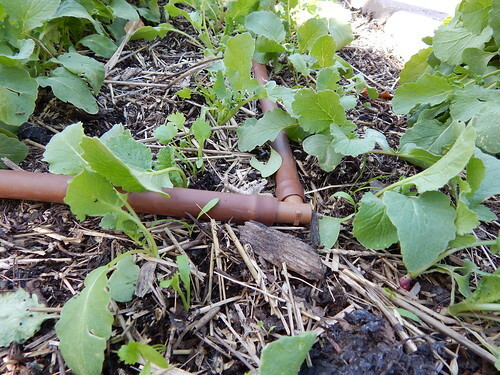 I tried to gently tamp the soil around the roots of all the plants, since I was disturbing them by pulling radishes. A few of the radishes. Some were good sized and others were still very small. These are the French Breakfast radishes. 1. It is very tedious to remove the radishes without damaging the parsnips! 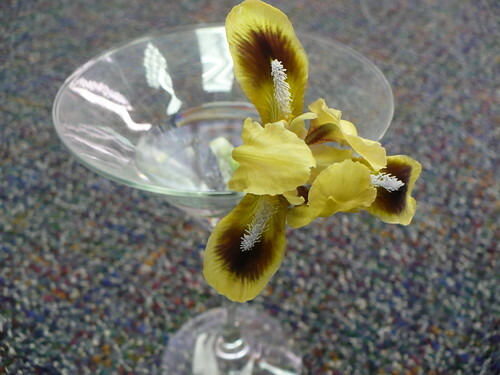 It is probably not worth it to do this unless you don’t have the space to plant them separately. 2. The timing doesn’t work out as well as I had hoped, BUT that could just be the crazy spring-winter-spring-summer-winter-spring we are having. Ideally the radishes would have been completely pulled out by now. 3. 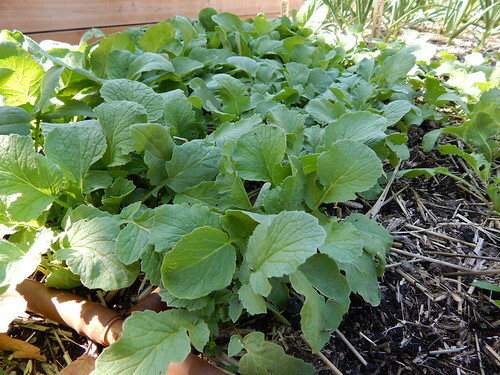 I think the optimal way to do this type of planting would be to plant the parsnips very thickly (maybe as much as 1.5x as many seeds as ideal) and to plant the radishes very thinly (1/2 as many seeds as normal). That way you wouldn’t have to be as careful pulling out the radishes and worrying about losing too many parsnip plants in the process. Have any of you tried this type of thing before? Did it work out? 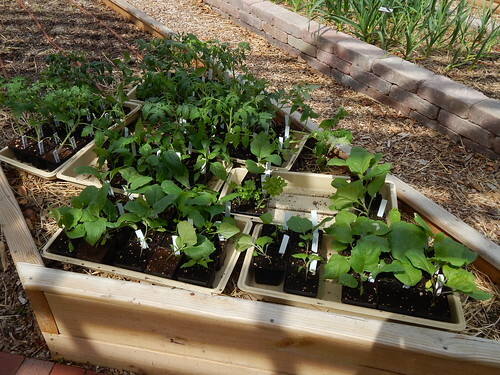 I finally got the seedlings outside for the first time yesterday. They did pretty well. I also ended up spraying them with pyrethrin because the aphids were starting to get out of control on the peppers and eggplant. 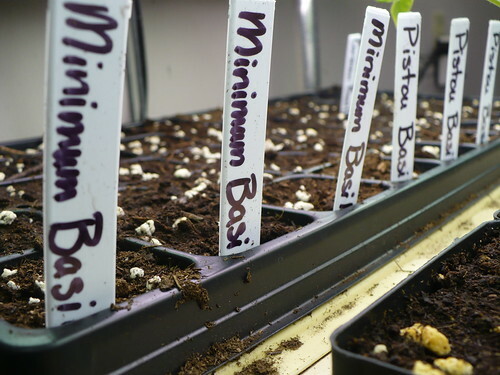 Hopefully I will be able to get them outside a few more days next week before we plant them. Look at this! I pulled the pot I planted the ‘Candy’ Stevia seeds in out of the refrigerator where it was chilling, and I have a couple of seedlings coming up! 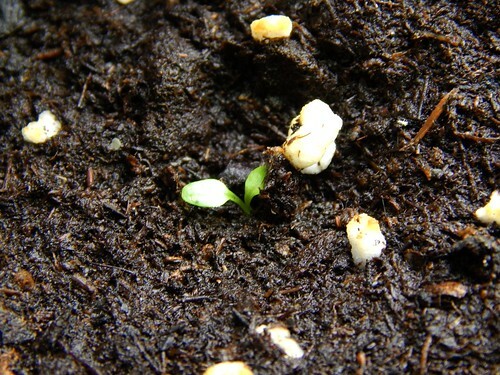 Honestly, I didn’t expect anything to happen, but I’m thrilled that a couple are growing. 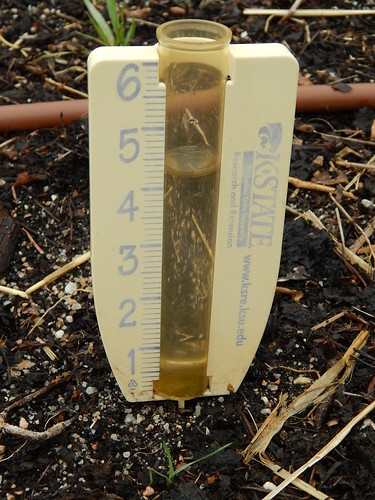 And yes, that soil is pretty saturated. It needs to dry out a little bit more. 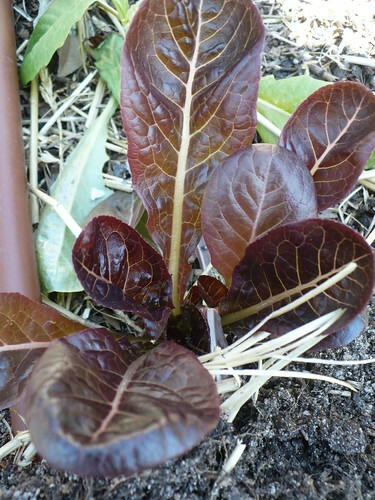 This is the same spinach that we had growing all winter in the cold frame. It has gotten huge! It is also well past its prime and is about ready to be yanked out. You would think that with the cool (and cold) weather it wouldn’t have gotten to this point so quickly. 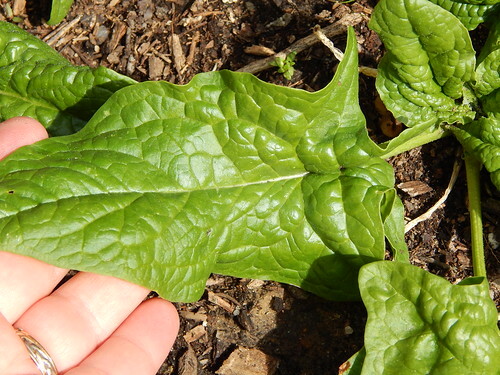 When your spinach starts to get elongated leaves with pointy tips and pointy areas near the stem, it will be bolting soon and is probably somewhat bitter in flavor. 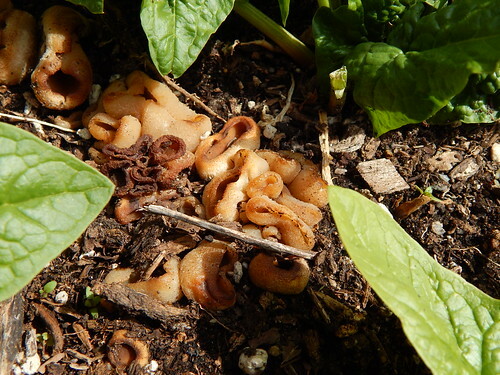 Also seen in the wheelchair accessible garden with the spinach is this cool fungus. Because the bed is deeper, the bottom section was filled with wood chips, leaves, (I think some Christmas tree mulch? ), some topsoil, and compost. Fungi are by nature decomposers, so it is not the least bit surprising to see these spiffy fungus popping up in the bed. They aren’t a concern as long as no one tries to eat them. They will go away when there is nothing left to decompose. 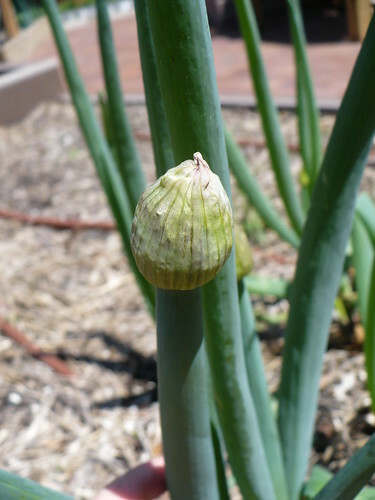 The bud on the ‘Red Beard’ onion is finally starting to crack open. 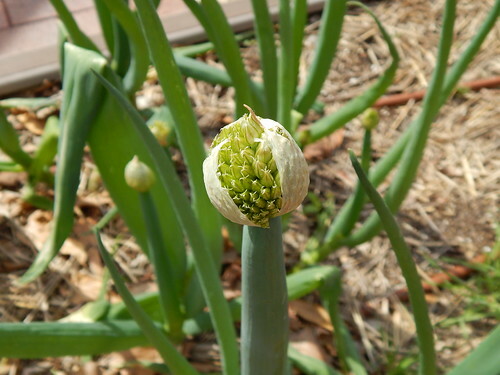 Each individual flower still is waiting to open. 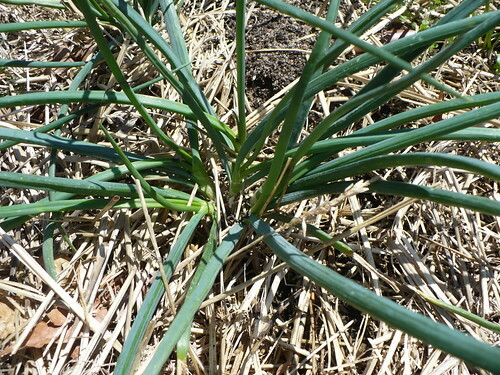 These onions will be getting pulled out when we plant tomatoes next week, so I’ve been hoping that they will hurry up and bloom first. I think the warm weather should push things along a little bit. 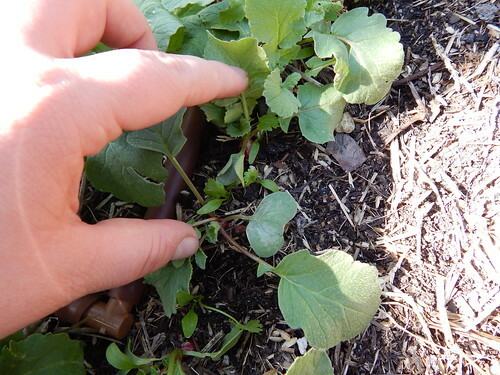 The radishes, which have also been taking their sweet time growing, are finally starting to show some root swelling. It’s a good thing too, because we really need to thin out some of them to give the parsnip seedlings a little more light and space. Have a great (warm) weekend! Combine green beans and ½ cup water in a medium sauce pan. Cover, and bring to boil. Reduce heat to medium, and let beans cook for 10 minutes, or until tender. Drain well. Place beans in a medium serving bowl, and mix in bread crumbs, olive oil, salt, pepper, garlic powder, oregano and basil. Toss mixture until the beans are coated. Sprinkle with Parmesan cheese, and serve. Makes 4 servings. It is starting to tax my creativity to come up with a new way to say the same thing every week! In a crazy fit of non-foresight, we had planned to plant tomatoes in the garden today. Yeah…not so much. Barring that, we were hoping to do a little work in the garden today. Nope, not that either. The current plan is to do some weeding, mulching, and other general work next Tuesday as we prepare for Herb Day and then plant tomatoes on Thursday before Herb Day…that way I should have enough time to get the poor tomatoes hardened off and used to the weather. We’ll then move on to things like eggplant and peppers after that. If you want to hope for this cold, dreary weather to end, the long-range forecast says it is supposed to be 85 degrees 2 weeks from today! I’m not holding my breath.